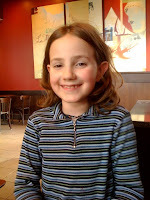 Yesterday, at my favorite Starbucks, I was interviewed by a very smart young girl named Sarah. She just turned 10 in December and she's a very bright girl. For a school project she decided to report on how stories are made and her teacher gave her the idea of interviewing an author. Sarah came very prepared. She didn't have just a piece of paper with the questions she wanted to ask; it was more of a collage, and I think it was even laminated. Her questions were very smart ones: How did I think of my stories; what made a story a good one; and more. Six questions in all. Her mom videotaped the interview. When Sarah was finished, I asked if I could ask her some questions. I wanted to know what she was writing. This little 10-year-old told me she was writing a novel--a fantasy adventure about a magical necklace that transported her characters to other worlds. Soooo cool! And she's 10 years old!!! She said this was going to be a series. Wow! I've been interviewed by newspaper reporters, TV and radio hosts--in Canada and the US--and I have to say, this was my favorite interview. It's not every day that a child Sarah's age decides to interview an author. She told me in her email that she'd never met a "real author" before. I am very happy to be her first "real author", and I suspect this girl's going to meet many many more. Oh, and of course I just had to give her a signed copy of Whale Song! After all, the main character is named Sarah. Thank you to Sarah and her Mom for giving me a very special day, one I won't forget. And thanks also to them for allowing me to post the picture of the youngest reporter I've been interviewed by! When is your next novel going to be published? Hysterical amnesia--or is that "historical"
Whale Song is "a magical journey"